The results are in!!! As anyone who came out to enjoy the desserts knows, the desserts were all incredible and each restaurant had put a lot of thought and passion into their creations. Hearing from people throughout the challenge, everyone seemed to have a different favourite and that has been reflected in the voting. There were clear winners for ‘Most Decadent‘ and ‘Most Creative‘ but when it came to ‘Best Overall‘ the results were extremely close, with the winner gaining top spot by just one vote! Before I share the winners I just want to say a HUGE thank you to everyone involved in the challenge. The restaurants and chefs have been amazing, from being so keen to sign up and participate, to their fantastic desserts, to their enthusiasm to do it again next year. I have found it so incredibly heartwarming that they wanted to be pioneers with me and break trail with a new event…a vegan one no less! I would like to thank the sponsors for their generosity in donating prizing – Nesters Market, Vegan Supply, Daiya Foods and Field Roast. Thank you! 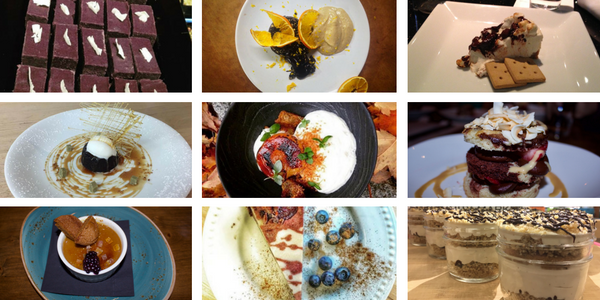 And I would like to extend a warm thank you to everyone in our amazing community who supported the event, from writing about it, helping promote it, sharing photos and most importantly, eating desserts!! Congratulations to The Cinnamon Bear Bar & Grille for winning, ‘Most Decadent‘! Second place goes to Stonesedge Kitchen and tied for third place were Milestones and The Green Moustache. Pastry Chef Karine Dubreuil’s, ‘Bitter Chocolate Lava Cake with Caramel Sauce, Served with Coconut Ice Cream & Matcha Green Tea Fudge’ was an absolutely beautiful dessert, described by some as looking like Christmas on a plate. The golden lattice garnish, beet juice dyed caramel, and matcha green tea fudge squares both decorated and complimented the warm, gooey chocolate lava cake with decadent elegance, making this dessert a real treat for both the eyes and the taste buds. This one was a personal favourite and I made any excuse to go back and eat it another time! Congratulations to Alta Bistro for winning, ‘Most Creative‘! Tied for second place were Cure Lounge and Cinnamon Bear Bar & Grille, and third place goes to Stonesedge Kitchen. If anyone’s been lucky enough to enjoy Chef Ed Tatton’s incredible vegan dishes at Alta Bistro, you would have had high expectations for this dessert. And Ed didn’t fail to deliver! His Peach and Prune Trifle (Caramelized Panorama Peaches, Sherry Cashew Cream, Prune Purée, Maple Sourdough Challah, House Grown Basil) was exquisite. This was no ordinary trifle and set the bar so high no future trifle may be able to reach it. Each element of this dish was perfectly crafted with thought going into each flavour and texture, giving every part of the dish it’s own importance. The elements combined beautifully in the dish to give a different taste and mouth feel experience in each bite. Divine! The votes were SO close for this one, and winning by 1 vote, congratulations goes to Stonesedge Kitchen for ‘Best Overall‘! Tied for second place were Cinnamon Bear and Alta Bistro, and third place goes to Cure Lounge. Stonesedge Kitchen is a favourite for vegans in Whistler as they have such a large choice of vegan options on their menu. Chef Erin Stone knows what it takes to make a tasty and satisfying vegan meal, and includes those extra touches that really make the dish, such as her rich and flavourful chipotle cashew creme. Erin made a Vegan Chocolate Mousse with Salted Coconut Caramel, Sponge Cake, Toasted Coconut Flakes & Macerated Strawberries that can best be described as ‘vegan comfort food meets fine dining’! Decadent, delicious and filling, this dessert was a crowd pleaser and left many a satisfied belly and happy grin. And the best news is…Stonesedge has decided to keep their incredible vegan dessert on the menu for winter!!! Congratulations are due to all of the participants in the dessert challenge, as all of them made creative, decadent and incredibly tasty desserts and every single dessert received votes. 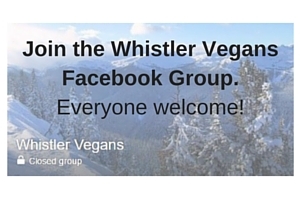 You all did an amazing job in showing the Whistler community and beyond how decadent vegan desserts can be! THANK YOU! I hope everyone, participants and diners, enjoyed the challenge. I can’t wait to do it again next year! For more photos of the event, check out our Facebook page. In addition to the restaurants and diners, I would like to say a special thanks to all who helped promote the event – Brandon Barrett, Pique Newsmagazine; Alyssa Noel, Whistler Question; Pip Campbell, Whistler Insider Blog; Whistler Blackcomb Messenger; Katrina Stuart, Plantified.com; Janelle Leclair; Marcus Culver; Lanndis de Lallo; Brad Meraly; Rebeccan Coleman; Twice as Nice 88; and Gone Deliciously Vegan. (I hope I haven’t forgotten anyone!) Thank you all so much for your support in promoting the event. It was very much appreciated! 1 Comment on Devilishly Decadent Vegan Dessert Challenge Winners!